Cameron's Specialty organic coffee has been getting a lot of mixed reviews from consumers. While many enjoy it, there are some that are less than thrilled by it. Right now, it is holding at 4.2 stars on Amazon. It also is sporting a badge for Amazon's Choice. So, let's see if it lives up to our expectations. The specific coffee we are looking at today from Cameron's Specialty organic coffee is their Organic French Roast. It is labeled as a Dark Roast, which means it will be a stronger coffee than say a breakfast blend or medium roast coffee. It has a brown sugary flavor, rounded body and a smooth finish. So while it is a stronger coffee than some other, it is not bitter or overpowering, which is always a great thing to hear. Cameron's Specialty organic coffee French Roast comes from farms in South America. However, they do not entirely specify as to where in South America the farms are located. They do say that it is a South American blend, so it is in fact not single origin. However, they do have personal relationships with all of their farmers, so the origin of the coffee is fairly trustworthy. All of Cameron's Specialty Organic Coffee is organic and more. Along with the USDA Organic certified seal, they also feature a seal for Shade Grown. Shade grown is very important as it is all about conservation practices. By growing coffee in the shade of trees, you are conserving our fresh water, along with fighting against deforestation. Many organic coffee companies claim that their coffee is shade grown but do not offer anything to back it up. Many places use this and similar claims to push sales, regardless if they are true or not. Thankfully, Cameron's Specialty organic coffee has the stuff to back it up. There are some very great features behind this coffee. Besides it being shade grown and organic, Cameron's Specialty organic coffee is also part of the Rainforest Alliance. This is a movement that ensures that coffee farmers maintain, or restore, natural forest cover to achieve 40% shade coverage. They are not allowed to alter natural water courses, traffic wild animals, destroy ecosystems, dump untreated water, or conduct other harmful practices. So it is like shade grown times 10. In addition, this coffee is roasted in small batches, to ensure freshness. Often times, coffee that is roasted in large batches looses its flavor over time from just sitting there, waiting to be packaged. Thanks to roasting in small batches, it is packages very soon after it is roasted. The idea for Cameron's Specialty organic coffee started back in 1978. But it was not until 1980 that the company was actually founded. By 1981, they had opened their first and only coffee shop in Hayward, WI. 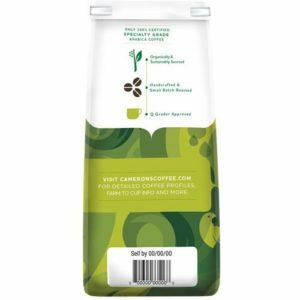 Cameron's Specialty organic coffee was originally founded by Janie and Jim Cameron, however it wasn't until the company was acquired by Bill Kirkpatrick that the company went global. Today, their facility is located in Shakopee, MN, but their coffee is available all over the US. They have personal relationships with each of their international farms, many of which are located in South America, even to the point where they meet the farmer's families. They ensure that each farm lives up to organic standards and buy the coffee directly from them. Cameron's Specialty organic coffee is USDA Organic certified and more. They also feature shade grown coffee, and are part of the Rainforest Alliance. All of their organic coffees are very environmentally friendly. While their coffee is not single origin, it all comes from certified farms. Each and every farm that Cameron's Specialty sources their coffee from, they have a personal relationship with. They use 100% Arabica coffee beans. In fact, they choose only the top 10% of those Arabica beans, to ensure that you always get a great quality coffee without the bitterness of some coffees. Speaking of bitterness, their Organic French Roast, while being a Dark roast is very smooth with a brown sugary flavor and none of the bitterness. The company Cameron's Specialty is a company invested in its farmers. They often buy their coffee directly from the farmers themselves. Unfortunately, many customers have reported that their coffee is very bland or have a taste like it was roasted a long time ago. This probably has to do with the way they package their coffee. They do not vacuum seal their coffee after it is roasted. So unfortunately, the flavor tends to fade over time. Not all of the coffee from Cameron's Specialty is organic, part of the Rainforest Alliance, or shade grown. While their organic line of coffee is, the rest of their coffee is just regular coffee. However, all of their coffee is fair trade, so there's that. Cameron's Specialty organic coffee seems to be a pretty good coffee. Unfortunately, due to their packing methods, the flavor may tend to fade a bit over time. And since they do not feature a "roasted on" date, it is hard to tell when the beans were roasted. However, their whole beans do tend to hold their flavor longer than their ground coffee. Also, Cameron's Specialty is not a sole organic coffee company. They have an organic line of coffee but they also deal in regular coffee. But they do ensure that everything is under Fair Trade. Overall, not a bad coffee, but probably not the best. Whether the pros outweigh the cons for Cameron's Specialty Organic Coffee is completely up to you. If you want to risk it the flavor fading and try it out, you can do so in confidence. However, due to the price, you may not want to. Currently, you can grab yourself a 32 ounce bag of their Organic French Roast for $25.99, which is a bit pricey. They also feature a 10 ounce bag for $10.18, so it actually seems like you are getting a decent deal by going for the 32 ounce. But it is completely up to you. For more information regarding the top 10 best organic coffee, head on back to Green and Growing. Here are some top questions that I found for people seriously considering buying Cameron's Specialty Organic Coffee. Where is this coffee grown?​ Their coffee comes from a wide variety of regions including Ethiopia, Sumatra, Kona, Jamaica, and Central and South America. What does each color bag mean? Premium (non-flavored) coffee is in blue packages, flavored coffee is in red, and sustainable coffees are in green. Does Cameron's Specialty contain gluten? Nope, all of their coffee is 100% gluten free.